“Horrible things happen during daytime, in beautiful places. But still we don’t see them.” Director Athanasios Karanikolas used these gloomy words to describe his actually rather tender At Home at the premiere at the Berlin Film Festival. Georgian immigrant Nadja is a patient and committed housekeeper for an upper class Greek couple and their daughter, although this is not immediately apparant: in the opening scene, Karanikolas shows her eating withb the family, even comforting the daughter as if she were a next-door-aunt, and the family’s luxuries and wealth are bestowed upon her too. By letting the actors use their bodies in stead of many words, Karanikolas manages to create subtle images that maintain movement throughout the film through fluid editing, concise acting and clear-cut scenes. Nothing feels too long or too short. 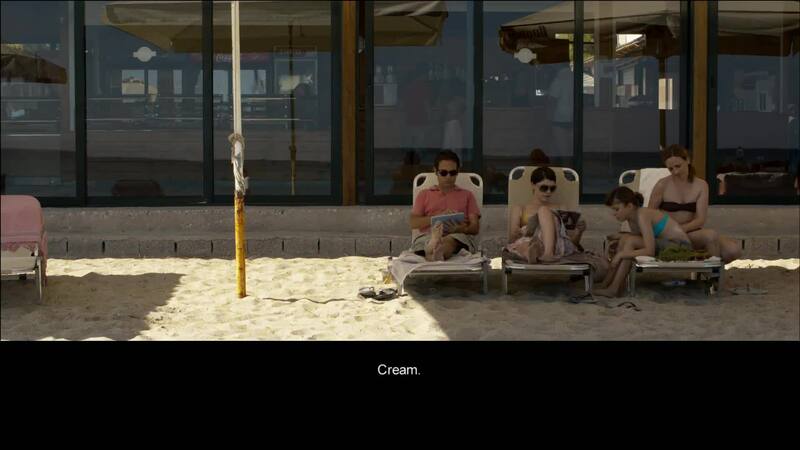 Through static framing of the family’s bright, sunlit villa, with its austere, modern, blue-and-grey interior, the film gradually implies another reading of Nadja’s relation to her surrogate family. When she collapses as the result of an undefined ailment, she is pampered with high quality medical care. But the balance between love and comfort is about to shift. Due to the economic crisis the family decides they can’t afford a sick housekeeper. Although they love her very much, as the lady of the house desperately emphasizes, they have to let her go. Accepting her fate calmly and showing minimal emotion, Nadja continues her chores for the last time that day. Gazing at the rippling sea through the broad living room window, she upholds herself as if nothing has changed. It turns out to be the first of many tragedies in Nadja’s life.